When coming to edit music, many beginners many feel worried because they don’t know how to do it properly. Cutting and trimming can be an important part of editing music file, and now you can do it easily with an easy-to-use free audio editing program called iMovie. 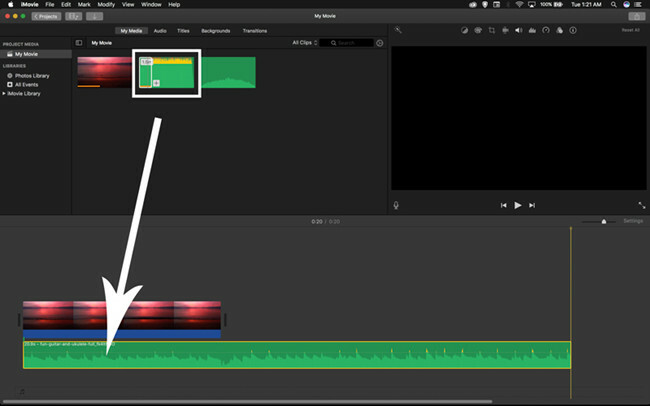 Apple’s iMovie is designed for macOS and iOS, so you can use it to split music file on Mac and iPhone/iPad/iPod touch. 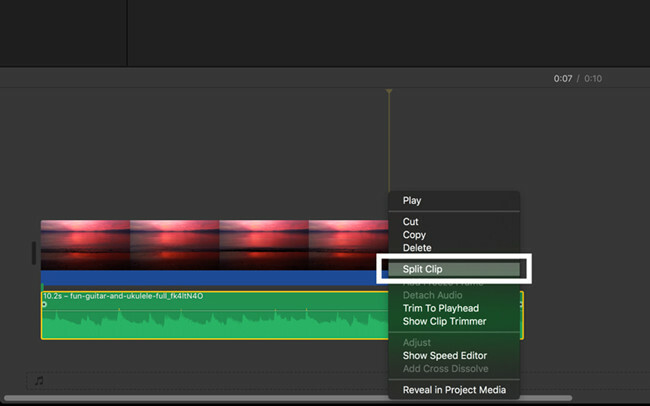 Next we will show you how to trim music in iMovie on Mac and iPhone step by step. Splitting or trimming an audio file means you can rearrange or shorten the length of the clip. Now just follow the detailed guide below to see how easily it is to trim music in iMovie on the macOS computer. First of all, please open the iMovie program on the Mac. Click the "Import Media" option to add a song file you'd like to trim or cut, and then drag and drop it to the Timeline. Highlight the file and drag the playhead to the desired frame. 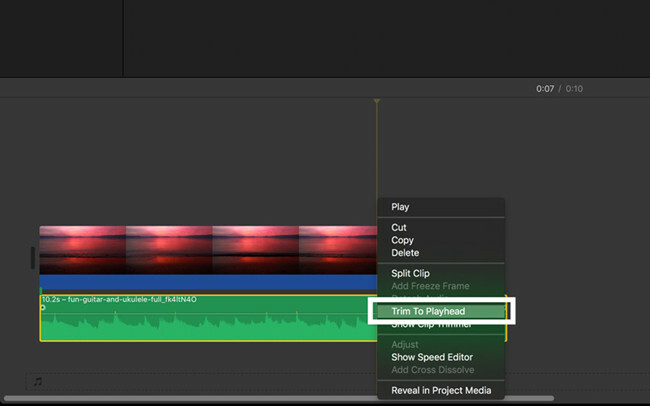 Right click on the clip and select the "Trim to Playhead" to trim the music file to the proper length; or select the "Split Clip" to cut the audio file into two parts, and you can keep the one you want and delete the one you don't like. After finishing the trimming or splitting, now you can export the song file by pressing the "Share" icon in the top right corner. Then rename the file and choose a location for storage, and click the "Save" button to export it to your Mac. You're also allowed to publish it to a number of popular sharing websites. 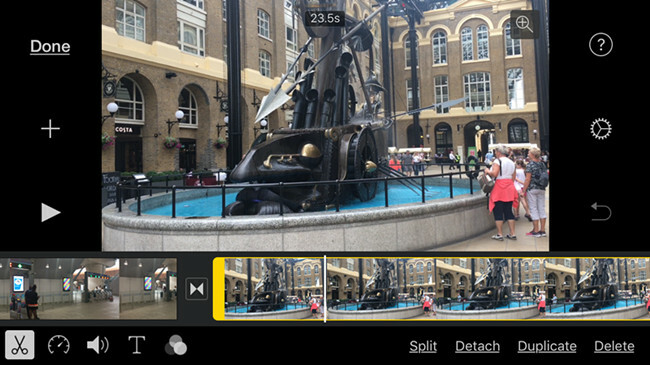 Alternatively, you can also trim or cut a song file on your iPhone with iMovie app in a few clicks only. The following guide will tell you how to do it in detail. Download the iMovie app from Apple store, and then install it on your iPhone. Open it and then add an audio file to the program. Remember to drag it to the Timeline for trimming or splitting. Tab the audio clip you want to trim and the trim handles appear in yellow. Drag the trim handles to determine the start point and end point, and then tap outside to make the handles disappear. If you want to split an audio clip, you can move the playhead to desired position and then tap the Scissors icon in the bottom-left corner and then press the "Split" button to cut the music file as you wish. When you're happy with the file, tap the "Done" button. Now you can listen to the trimmed or splitted song and then press the "Share" button to send it to your friends or families. 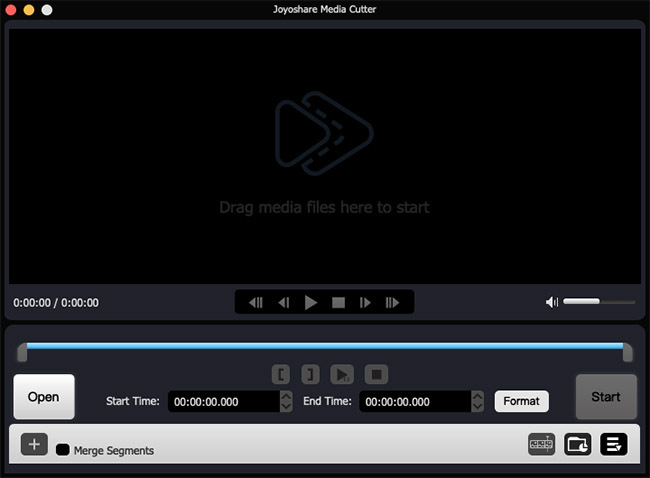 Joyoshare Mac Media Cutter is an optimal iMovie alternative for Mac users to cut audio and video files at a super fast speed without causing any quality loss. With the program, you can easily split any large audio files into small segments, create customized ringtone for smart phones, remove background noise of the music file, and even extract any audio tracks from video clips, etc. Besides, Joyoshare Music Trimmer also offers you an opportunity to enhance your songs, such as apply special sound effects, add new background music for the file, etc. 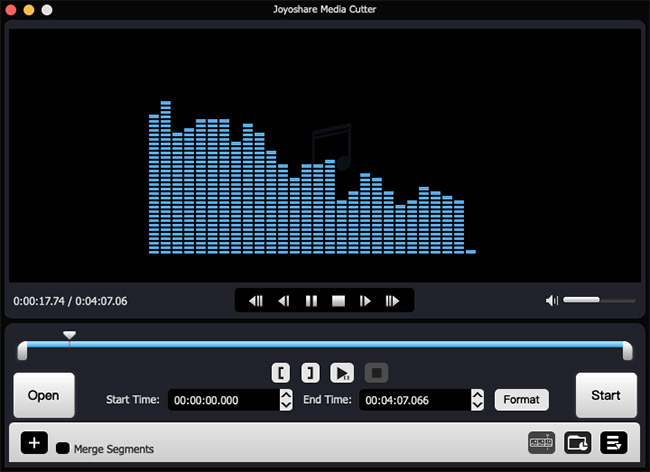 Additionally, Joyoshare Media Cutter supports tons of input and output media formats such as MP3, WAV, AAC, AC3, MKA, OGG, AIFF, MP4, MPG, etc., as well as a variety of common portable devices like Apple iPhone, iPad, Android, Samsung TV, Xbox 360, PSP, Blackberry Bold and many others. First go to the download page of Joyoshare and choose Media Cutter Mac version to download and install it on your Mac. After that, launch the program and add the required file by clicking the "Open" button or simply drag and drop a song file to Joyoshare. Next move the yellow handles to decide the start time and end time for the audio clip or enter the exact time values manually. Alternatively, you can click the Edit icon next to the clip and then tap the "Trim" tab in the new window. You can drag the sliders to set the desired portion. Keep in mind that you need to press the Scissors icon before hitting the "OK" button to close the window. Note: The same audio file can be cut into several clips at a time. If you want to join them to form a new, you can go to click the "+" button and tick the "Merge segments" option. Then click the "Format" button and you'll see available output modes for option. 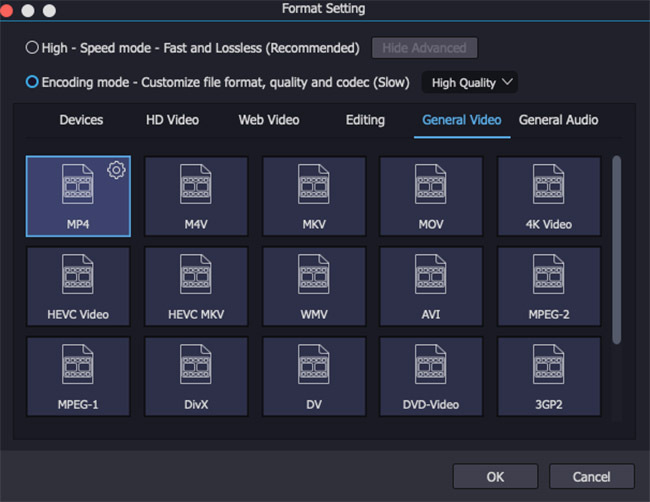 The "High-Speed mode" will help trim and convert the audio file quickly in lossless quality while the "Encoding mode" will give you rights to customize the video in your preference, such as video quality, codec, bit rate, formats, devices, etc. Here we recommend you to choose the first output mode. Now click the "Start" button to set out to cut the music file losslessly. Wait a few seconds, you can find your trimmed audio file on the destination folder of your computer.